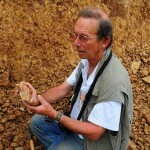 Robin Dennell, FBA, is currently Emeritus Professor of Human Origins at the University of Sheffield, and formerly held a British Academy Research Chair (2003-2006) and a Leverhulme Senior Research Fellowship (1989-1992). He has had extensive field experience since the 1970s in Bulgaria, Iran and Pakistan, and is currently involved in fieldwork in China. His main research interests cover hominin and human dispersals and settlement in Asia, particularly in relation to climatic change.